NORWALK >> Deputies and concerned family members asked the public’s help Friday in finding a young disabled couple from Norwalk who disappeared Wednesday. 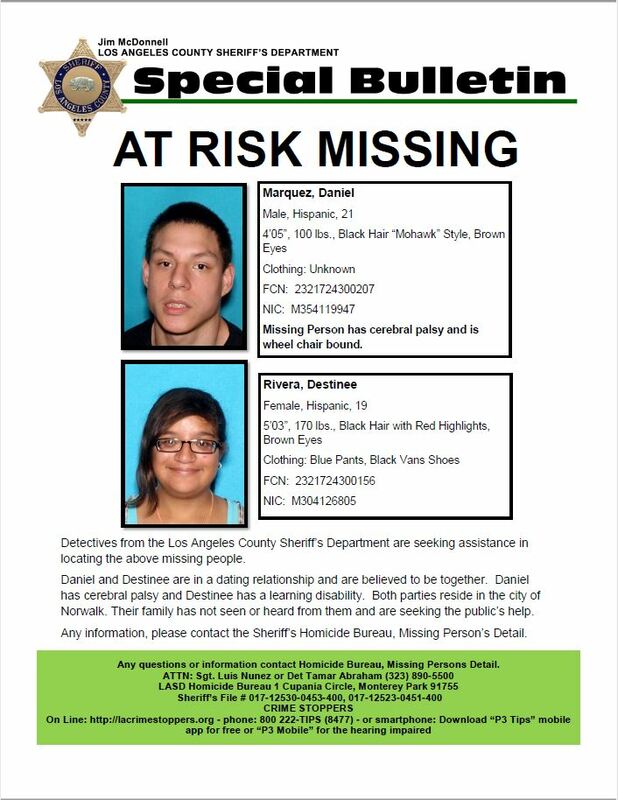 Daniel Marquez, 21, and Destinee Rivera, 19, were last seen Wednesday morning and Wednesday night, respectively, Deputy Ryan Rouzan of the Los Angeles County Sheriff’s Department’s Information Bureau said in a written statement. Marquez was last seen about 6 a.m. in the 13400 block of Flatbush Avenue, while Rivera was last seen about 10:30 p.m. in the 12300 block of Studebaker Road. Marquez is 4 feet 5 inches tall, 100 pounds, with brown eyes black hair in a “Mohawk” style. He has cerebral palsy and uses a wheelchair. Rivera is 5 feet 3 inches tall, 170 pounds, with brown eyes and black hair with red highlights. She was last seen wearing blue pants and black Vans shoes. She is believed to have a learning disability. 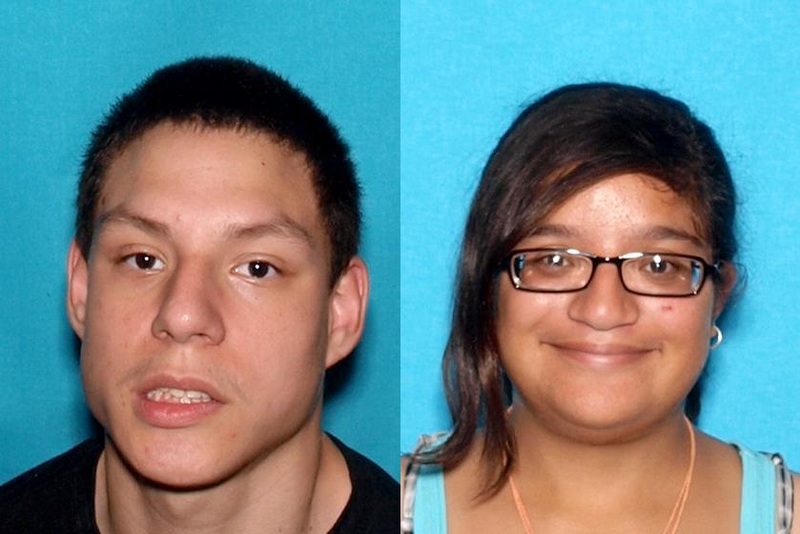 Anyone with information about the missing couple is urged to contact Sgt. Nunez or Detective Abraham at the sheriff’s Missing Persons Detail at 323-890-5500. Detectives searching for the body of a 5-year-old South Pasadena boy missing for more than two months, and allegedly killed by his father, discovered the child’s remains Friday in Santa Barbara County, authorities said. 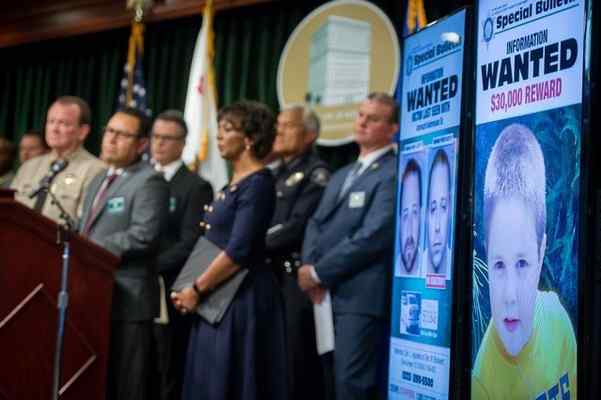 The remains of Aramazd Andressian Jr. were discovered Friday during the latest of several searches of the area near Lake Cachuma on Friday, Los Angeles County Sheriff’s Department spokeswoman Nicole Nishida said. His identity was confirmed Saturday morning. Investigators from all over Southern California descended on the Lake Cachuma Recreation Area in Santa Barbara County Saturday to continue their search for signs of a 5-year-old South Pasadena boy who vanished under suspicious circumstances in late April. 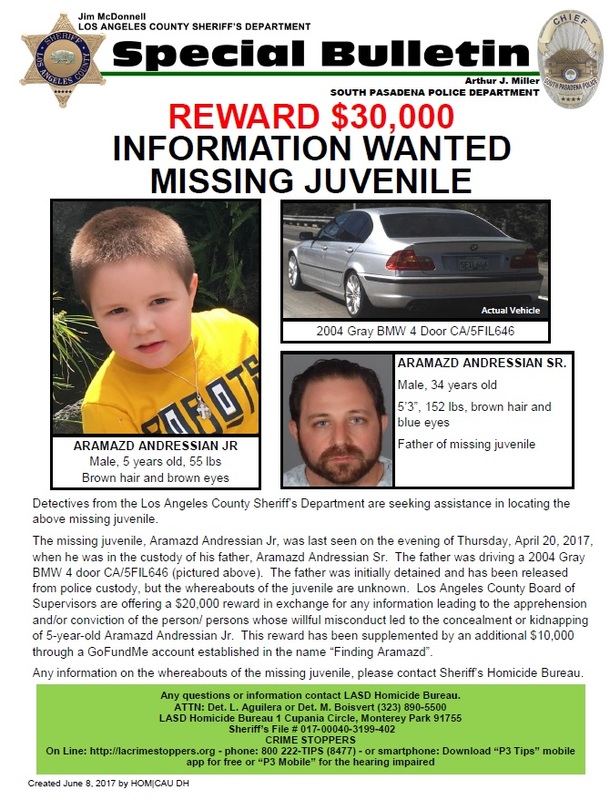 Aramazd Andressian Jr. was reported missing April 22 after his father failed to bring him to a scheduled custody exchange, according to Los Angeles County sheriff’s officials. His father, Aramazd Andressian Sr., was found unconscious earlier the same day near his car, which was parked at the Arroyo Seco Park in South Pasadena. His car was doused in gasoline and there was a rag sticking out of the gas tank. The father told investigators he had taken prescription pills belonging to someone else and had no idea what happened to his son. The father and son were last seen together at Disneyland on April 21, officials said. Witnesses also reported seeing the boy and his father on April 21 at the Lake Cachuma Recreation Area, as well as near Solvang and Nojoqui Falls. 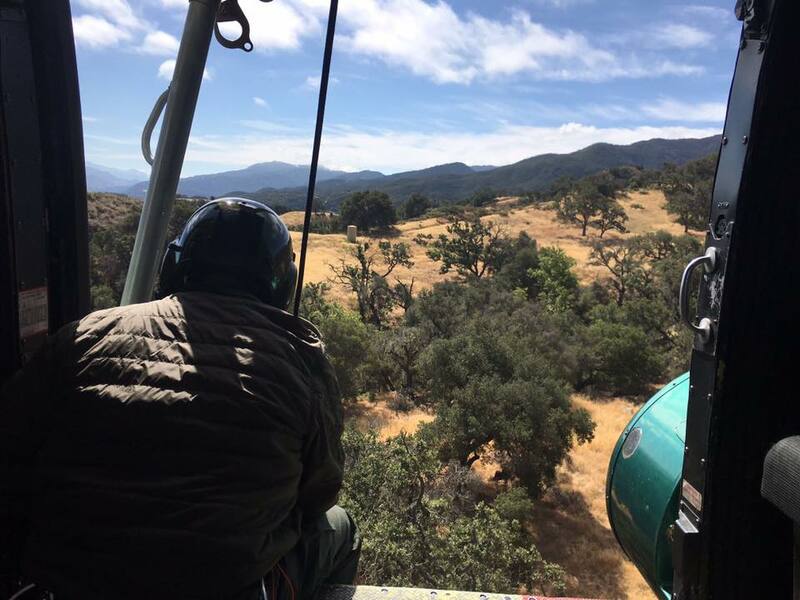 Authorities have already made repeated searches of the parks in South Pasadena and Santa Barbara County without results. Los Angeles County sheriff’s officials were joined in Saturday’s search by the Santa Barbara County Sheriff’s Office, the South Pasadena Police Department, the Los Angeles County Fire Department and law enforcement agencies from through the San Gabriel Valley, Deputy Don Walker of the sheriff’s Information Bureau said in a written statement. Search and rescue teams and search dogs were brought in from throughout the region to help. But at the conclusion of Saturday’s search on Friday, no signs of the boy had been found, officials said. Saturday’s search covered roughly 30 miles of road between Nojoquu Falls, Solvang and Lake Cachuma, Rodriguez said. “Homicide investigators would like to thank the more 235 personnel who rejoined to the search,” she added. 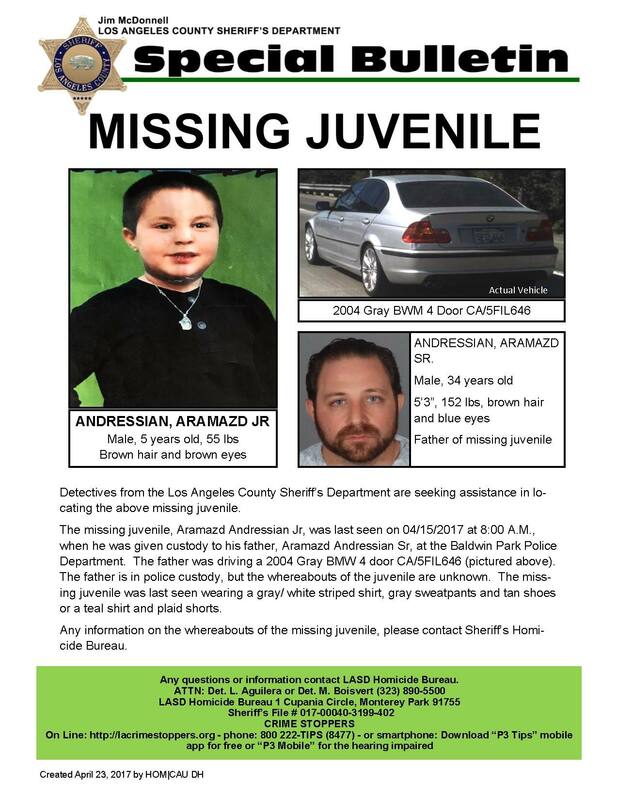 In the weeks since the boy disappeared, family members and volunteers have canvassed the region and handed out fliers, and detectives have served search warrants at the homes of both Andressian Sr.’s South Pasadena home, and the home of the boy’s paternal grandmother in Montebello. 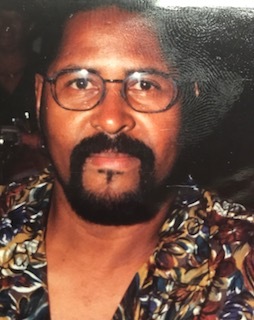 The Los Angeles County Board of Supervisors has offered a $10,000 reward for information in the case. ALHAMBRA >> Police found a woman safe in South Pasadena after went missing in Alhambra on Tuesday night. 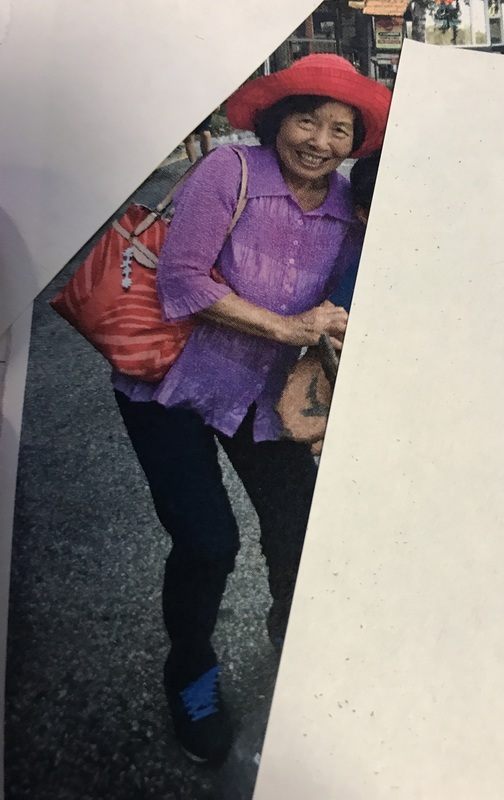 Wei Li, 71, was last seen about 9:30 p.m. Tuesday in the 100 block of North Third Street, Alhambra police officials said in a written statement. “Li does not have a cellular phone and does not speak English,” according to the statement. She’s described as Asian, 5 feet 4 inches tall and 138 pounds. She has brown hair and brown eyes. But she was found safe in South Pasadena on Wednesday afternoon and reunited with her family, police said. SOUTH PASADENA >> Police and sheriff’s officials continued searching Sunday for a 5-year-old boy who was reported missing after his father, who was responsible for the child, was found unconscious in a South Pasadena Park and arrested him. 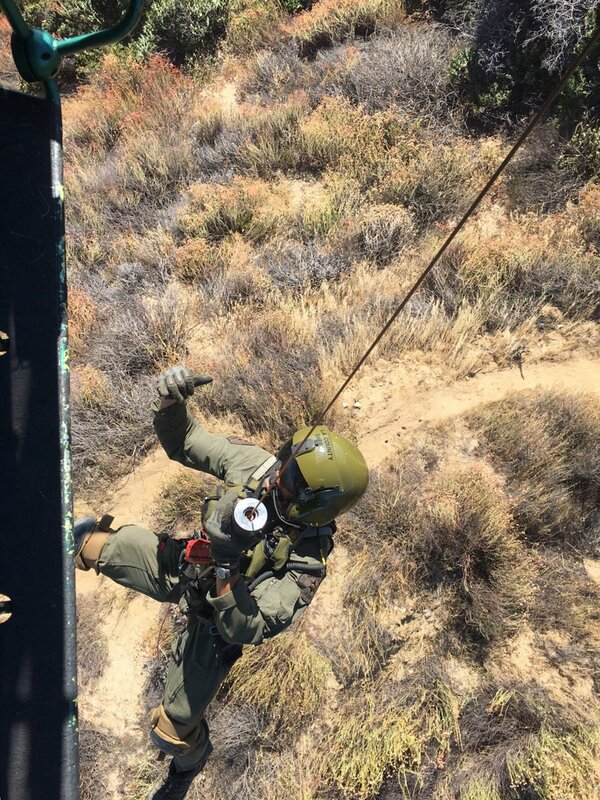 Search and rescue teams, helicopters, search dogs, neighboring police agencies and the Los Angeles County Sheriff’s Department’s Missing Persons Detail have joined in the search for Aramazd Andressian Jr., which centered around Arroyo Park in South Pasadena, sheriff’s and South Pasadena police officials said. 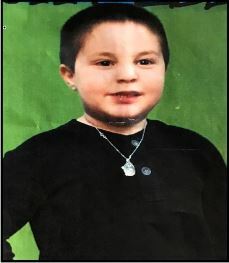 The boy was last seen by his mother on April 15, when she turned him over to the custody his father, Aramazd Andressian Sr., during a child custody exchange at the Baldwin Park Police Department, according to Deputy Lisa Jansen of the sheriff’s Information Bureau. The parent’s are in the process of divorcing, officials added. The boy’s mother last heard from him Tuesday, when she spoke with him via a “Skype” video call, South Pasadena police officials said. Police in South Pasadena reportedly found the father passed out next to his parked car at the park about 6:30 a.m. Saturday. Officials took him to a hospital for examination before he was arrested. It was unclear why the man had lost consciousness. The boy’s mother reported him missing later Saturday after Andressian Sr. failed to show up for his scheduled custody exchange, authorities said. He hasn’t been seen or heard from since. “Aramazd Andressian Jr.’s family is very concerned and asking for the public’s assistance,” Jansen said. Aramazd Andressian Sr. had been driving a gray, 2004 BMW four-door car with a California license plate of 5FIL646. Prior to his arrest, the vehicle was last reported seen in Orange County early Friday. The father was said to be cooperative, but investigators expressed concern that he did not appear to be a crime victim but did not know the whereabouts of his son. Aramazd Jr. is described as 41 inches, 55 pounds, with brown hair and brown eyes. 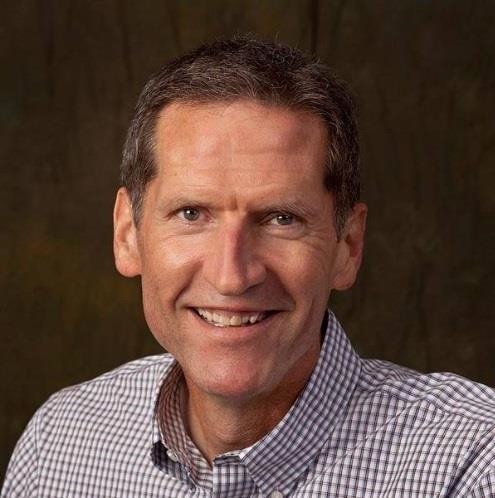 He was last seen wearing a turquoise plaid shirt and plaid shorts and has a small mole on the bottom of his right shoulder. Anyone with information is urged to contact South Pasadena police at 626-403-07270 or the sheriff’s Missing Persons Detail at 323-890-5500. Tips may also be submitted anonymously to L.A. Regional Crime Stoppers at 800-222-8477.